Paul Farinacci holds both a B.F.A and M.F.A. 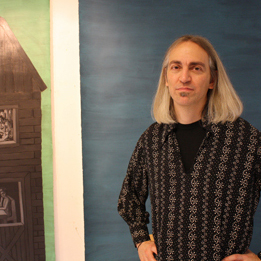 He is currently a professor at Hoftstra University, and is also an art specialist at Shaw Avenue School. He has been awarded a number of fellowships and grants from the U.S. and Europe, such as the Fulbright and NY Foundation for the Arts. He has also done public art commissions including: a mural in NYC, for the Health Dep’t and the Mayor’s office and sculptures for the Carnegie Mellon Museum, the American Cancer Society, Childline, London, AKC, NYC and Nassau County Sports/Recreation Authority. Farinacci’s sculptures and installations are constructed from cardboard and recycled materials, including newspapers containing the stories that he addresses in his work. Video and sound are included in his works as well to further emphasis his internal dialogue.